"I am sure you will have come across it but there is a slight chance that you dismissed it as so many did because of its whiff of the coffee table. It has colour plates all over the shop. This was its undoing: folk thought the text was just something to fill in the gaps between pictures. 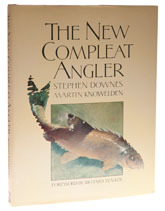 It was this book that led me to devise my simple but infallible method of evaluating new fishing books. When I pick one up I look in the index under "K". If it says things like "Kennet", "knots" and "Kite, Oliver" then I quietly put it back: I have read all that before. The New Compleat Angler has just two entries under K. They are "Kemal Ataturk" and "Kidney-stones: treatment for," : you can readily spot that here you will be reading something different. The thing scintillates with fascinating asides on almost everything." I couldn’t agree more - this is a fantastic book. This is great writing - where is Stephen Downes now?